Hima Boutique is elegantly designed with a special naturally beautiful all teak hima in which you can find as your sweet home away from home during your stay in the cultural and historical city of ancient Angkor. 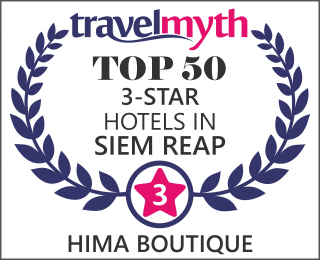 Within 33 rooms mixed traditional hima designated with Boutique facilities room, Hima Boutique experience is about peaceful and stylish relaxation, boutique comfort, and the enjoyment a range of activities beyond the discovery of the incredible Temples of Angkor. The boutique has a full restaurant service offering you to discover the taste of Cambodian dishes and all kind of drinks and cocktails. A Spa is also available to bring you the Asian sense of relaxation with a full range of massages. All rooms and outdoor areas of the hotel have complimentary WiFi access and there is a complimentary internet bay with the latest software and communications. Our Boutique Location is perfectly close to Central market, Old market, Night market, Banks and Pub Street.